Jewelry Showing Tonight in Houston – Don’t Miss It! Jané will be showing Butterfly Project jewelry tonight at the anti-trafficking concert in the Upper Room of Chapelwood United Methodist Church in Houston. The concert is from 6:30 until 7:45 and is free. Jewelry will be on display beginning at 5:30. Don’t miss this important awareness raising event presented by Olivette! Christina is a girl, like thousands of others who is at grave risk of being trafficked. She is a real girl, with a real personality, with real hopes and dreams. She is also a symbol for all the girls we can and must rescue BEFORE she is trafficked. When, at age 15, she is kicked out of her orphanage in the tiny, poor Eastern European country of Moldova she will have no family, no money, no education and no job training. She is likely to walk directly into a traffickers arms, someone who will promise her a job, a home, a future. There are thousands if not millions of “Christina’s” in dozens of other countries who have been trafficked and who will be trafficked. We have to stop thinking of human trafficking in terms of the 27 million who are enslaved. That number is too overwhelming. The point of “Christina” is to try to get people to think about trafficking in terms of one little girl, one life, one child named Christina. To think about the one. In the words of Gary Haugen, founder of International Justice Mission, it has to be about the one. For us, it’s about Christina. 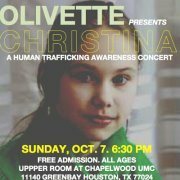 “Christina” is 75 minute concert that will take you on a journey into the heart of human trafficking. It will invite you to sing, pray and intercede for those enslaved and for those at risk of being enslaved. It will give you an opportunity to connect with organizations both near and far who are doing the work of justice to rescue the fatherless from exploitation. It will sit you side by side with others who cannot stand to do nothing any longer. Join us. Spread the word. Invite a friend. Be sure and join us for some great music and fellowship, and for the opportunity to purchase some Butterfly Jewelry and help better the lives of girls rescued from this horrific trade!